The Kubernetes community has now finally made the announcement of the creation of their new project called Kubeflow, that aims at providing a hand in solving some of the challenges of deploying complicated workloads. 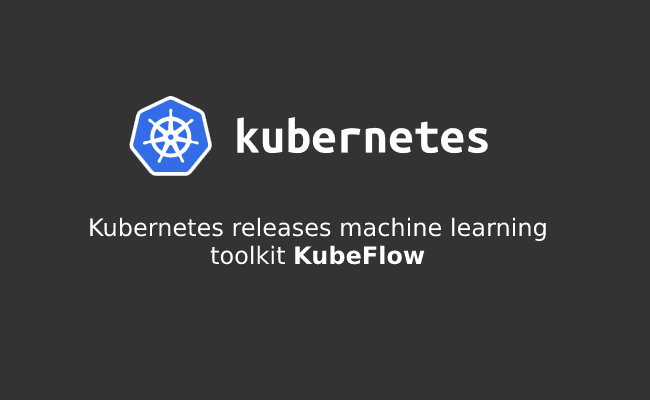 According to the team, Kubeflow has been designed in order to make it easier to use machine learning stacks on Kubernetes and since it relies on Kubernetes to run, it can run anywhere where Kubernetes runs, therefore, making it easy to set up for all Kubernetes users thus making it truly scalable and portable. The Kubeflow project contains JupyterHub, Tensorflow Custom Resource (CRD), and a Tensorflow Serving container, which makes it the hybrid solution, and deployment platform of choice for machine learning. A JupyterHub that helps in the creation and management of interactive Jupyter notebooks. A TF Serving container in addition. Easy, repeatable, portable deployments on an infrastructure that is diverse. Deployment and management of loosely-coupled microservices. Scaling that is based on demand. Because practitioners of ML use so many different types of tools, it is a key goal that within reason one can customize the stack to whatever the requirements are, and then let the system further take care of the other stuff. While as of now the team as started with a narrow set of technologies, they are also currently working with many different projects in order to include additional tooling. Ultimately, to be exact, the team wants to have a set of simple manifests that provide us with an easy to use ML stack anywhere where Kubernetes is already running and can self-configure based on the cluster that it gets deployed into. The company also believes that most Kubeflow users will be working with multiple environments and this makes ksonnet very useful as it makes very simple moving of workloads between multiple environments. As of now, Kubernetes, currently, is trying to build up a community for this project and has thus collaborated with, Weaveworks, Red Hat & OpenShift, Canonical, and Container Solutions, and many more to do the same.